Hugh teaches drum classes in the California bay area and other locations around the world. Contact Hugh to find out about venues where he is currently performing or teaching. 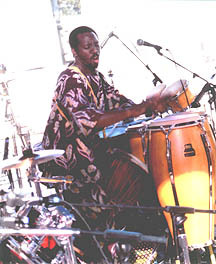 The Caribbean rhythms Hugh teaches are traditional secular Caribbean rhythms reflecting the rich musical heritage of Trinidad and Tobago. The keg drum is a traditional instrument played in Trinidad. The deep throaty sound of the bass drum and the crisp penetrating sound of the cutter drum balanced with sounds of the fuller are unique sounds unlike any other drum. Each drum is played using bass, tone, rim, and slap sounds giving each rhythm the lilting complexity of Trinidad music. Originally the drum was made from a keg as shown at left. The two drums shown at right are raw (unfinished) carved keg drums. When finished, these drums will have much of the same sound as a drum made from a keg but can be tailored to its final size and sound. Since each of these drums is hand carved from a Mango tree, the drum craftsman has much more control over the size and shape than if empty kegs were used. The two drums shown have just been carved and do not have head, rings or lacing yet. Cutter - the solo instrument. This is usually the smallest drum. The cutter is the center drum at right. Fuller - the instrument that plays the fuller part, usually a steady square pattern that the other parts play against. The traditional painted keg drum on the right is the fuller. Bass - the drum that plays the bass line. he drum at left in the picture is the bass and is same unfinished drum shown at left in the picture above but with rings, lacing, and head.